[THE GIVEAWAY IS NOW CLOSED: Congrats to Christopher S. for winning!] IT'S LIVE! 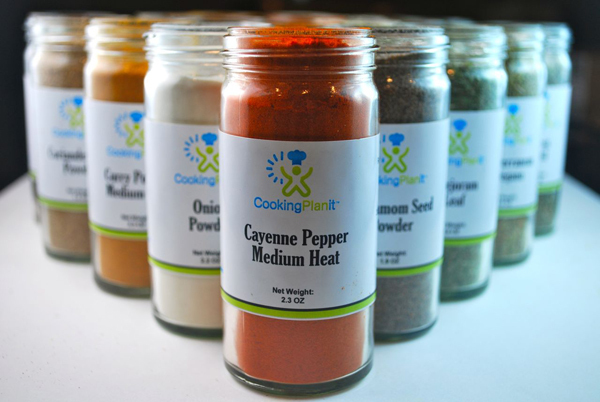 I hope you had kept today on your radar for the launch of my super awesome Cooking Planit spice giveaway. Courtesy of Cooking Planit and Spices Inc., I happily get to give away to one of you lucky readers a spice set of 26 of the most commonly used spices (retail value: $100+). As you may already know, there were 49 other bloggers given this opportunity which gave you more chances to win. The full list below shows you whose contests are still up and running. Much Ado About Fooding's contest period is March 26 - April 1. I'll be announcing the winner (randomly chosen through the Rafflecopter program) on April 2nd. The more ways through which you participate, the more chances you have to win a newly stocked spice pantry! The winner will be contacted once chosen and must respond within 48 hours with the proper information to receive the prize which will be shipped out to the winner by the giveaway sponsor. This means that anyone in the U.S. can win so don't be afraid to enter! You have multiple ways to participate in this giveaway - via Facebook, Twitter, and commenting on the blog post itself. I highly encourage you not only to enter my contest but the other contests that are also happening as well. You should definitely also invite your friends and family to participate in this contest because it really is a swell deal, isn't it? Photography courtesy of Emily Wilson, eChef for Cooking Planit. I'm gonna cook some really yummy meatballs and sauce from scratch! topped with fried tofu and peanuts! Completely didn't know you cooked a lot Tim - that sounds divine, especially since I LOVE curry! Where's the "like" button on comments? =] Nice choice! Melted cheese sounds so good right now. I've never cooked with cardamom before and would like to find a recipe to use that in. Something vegan and Indian. These look amazing! I am going to make some pasta! Spicy enchiladas with cumin and red pepper. That sounds so tasty. Sounds like you'll need a lot of red pepper if you're a heat-seeker! What would you try making? With lots of spices to work with I'd make something Tex Mex! Would you do it from scratch? Ooey gooey Tex Mex-ness? I would really like to try the Pennsylvania Pepper because it sounds...interesting? I never knew it was a thing and I like peppers in general. I will probably make some perfectly spiced tofuballs and serve them up with homemade spiced marinara sauce and some spaghetti squash! Nice! Add some spiciness to that sweetness! Maybe a cinnamon creme brûlée or a souffle. A chicken curry could be tasty too. A vegan "eggs" benedict brunch! Any sentence with "brunch" in it is pretty much a win (unless it says you don't like brunch...). I would use a lot of these in my homemade pasta sauce(s). I'd make some rosemary potatoes! Simple but oh so tasty - yes! I would make a fettucine alfredo with ham. I would bake many muffins! Would you use exotic flavors then? There are so many spices in the set! I'm not familiar with the Manzanillo Mexico Seasoning so I'd like to try it. Perhaps in chile? Oo I haven't made chili before but I've been so curious. Any cool tips you've got for it? i will likely make a pulled pork or a pasta salad. Vegan Potato Curry! Uses curry, cumin and lots of other spices! What are you going to fill it with? I'd like to try making bbq. I'm not the griller in the family, but I suppose having these spices will at least be a good start. I'll make some turkey chili! Ah - how much does it change a chili's taste to use turkey instead? I am going to make many South Indian dishes with it - starting with a spicy mutton vindaloo curry and a mutton biryani! Thanks for a fantastic giveaway! sage, hoomemade stuffing for mushrooms !!! I would make a dry rub for a pot roast. i would make something w/ the chinese five spice. i saw a recipe once that called for it but i had no clue (beginner cook) so i didn't make it. but if i won, i will definitely try to make it with that spice. I had my first experience cooking with it a little bit ago and did a super simple recipe which you can find at http://www.muchadoaboutfooding.com/2013/02/test-kitchen-chinese-five-spice-tofu.html. =] I'd be excited to see what you'd do with five spice if you won!